After completing a lake (Lake Pontchartrain in Louisiana in 14 hours 55 minutes), river (76.4 km descent of the Colorado River through Canyonlands in Colorado in 13 hours 56 minutes), and a sea swim (38 km from the island of Culebra to Fajardo in Puerto Rico in 12 hours 1 minute), Matthew Moseley is now off preparing for another charity swim. 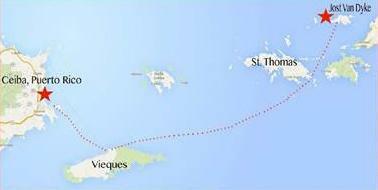 This one will be a tandem swim together with coach Randy Soler called the Swim Across The Caribbean, a 50-mile (80.4 km) 3-day tandem swim set for July 2017 where they will challenge themselves to traverse between four islands in three days in the Caribbean Sea. In the heat of the summer, the duo will swim to benefit the Ocean Foundation and Colorado Ocean Coalition. To follow the pair, visit here. The Colorado Ocean Coalition, a project of the Ocean Foundation, engages inland communities with land-to-sea stewardship with a mission to develop a two-way relationship with the oceans and water. Those who live among mountains, rivers, and inland cities have a direct impact on the cycles of life in the oceans. As the nation’s first Inland Ocean Movement, our goal is to be a wellspring for literacy and community engagement across all inland states.